The Management Center for WebSphere® Commerce is the next generation business user tool for managing online business tasks. It was introduced with WebSphere Commerce Version 6, Feature Pack 3, for example, catalog tasks, marketing tasks, and promotion tasks. 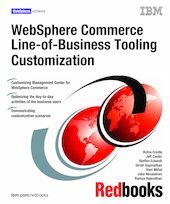 In this IBM® Redbooks® publication, we give you a broad understanding of the features and capabilities of the Management Center for WebSphere Commerce. In addition, you learn how the Management Center fits into the service-oriented architecture (SOA) framework of IBM WebSphere Commerce. Help you to install, tailor, and configure Management Center to optimize the day-to-day activities of the business users who manage merchandising and marketing tasks for stores that use the consumer direct and Business-to-Business (B2B) business models. Discuss the assets that make up the Management Center and what assets you can customize. Share some of the common customization scenarios. Demonstrate how to plan and perform customizations to the Management Center and how to understand the use of development tools for creating Management Center customizations. Provide examples of the customization scenarios that we developed and tested in the International Technical Support Organization labs and WebSphere Commerce labs, which are available for you to use. The target audience for this book is Commerce Architects, Commerce Developers, Project Managers, and Deployment Managers.